This restaurant is now unfortunately CLOSED. We have some friends that like to eat good food. And try new places. Last week he mentioned a new place that I had never heard of. It’s called The Outlook Cafe and it’s located in Rio Rancho, New Mexico, specifically in the View Larger Map“>Mariposa community. For some this may be a hike, but not us! After the initial suggestion by our friends, like always, I googled it to see how Renee and husband-friendly their menu might be. It looked like there were probably a couple of options for both of us, so I figured we’d try it. (I think my husband’s vegetarian-ism can be harder than my celiac/gluten free at times, since there are usually even fewer vegetarian items to choose from and most are low on protein.) Plus the beer, wine and hard cider(!) list looked enticing. As usual, I figured I might as well try emailing and/or calling ahead of time to see how they might handle my needs. I shot off my standard email about what I can and cannot eat as well as direct inquiries about a couple of the dishes that I figured would be options. Within hours, I had a response from the lovely Linda. She asked about any additional allergies or intolerances and told me that they could modify just about anything for me! Woo-hoo! That always makes one feel good. She asked us to make reservations and note the need for gluten free at that time. And it so happened that when I called to make those reservations, Linda answered the phone and when I told her who I was she said that she was just thinking of me as she was making a soup, thinking more about the ingredients this time around. Rest assured though that pretty much everything is made in-house from fresh ingredients. Their bread (off-limits to celiacs, of course) is made locally as well as a couple of other things. Upon our arrival, Linda greeted us and showed us to our cozy corner table. The atmosphere was wonderful and warm, even on a cold Friday night. There is a patio for the warmer months that looks nice as well. Periodically they have live music too, just check their Facebook page for updates. Of course, immediately we all were perusing the beverage list. I was interested in the variety of ciders they had, some of which I hadn’t had before. (There were only four ciders, but that’s three or four more than most places!) I went with a Fox Barrel Pear Cider. For the beer lovers accompanying you, there is a large selection of local beers with a few switching out seasonally. And local wines too. 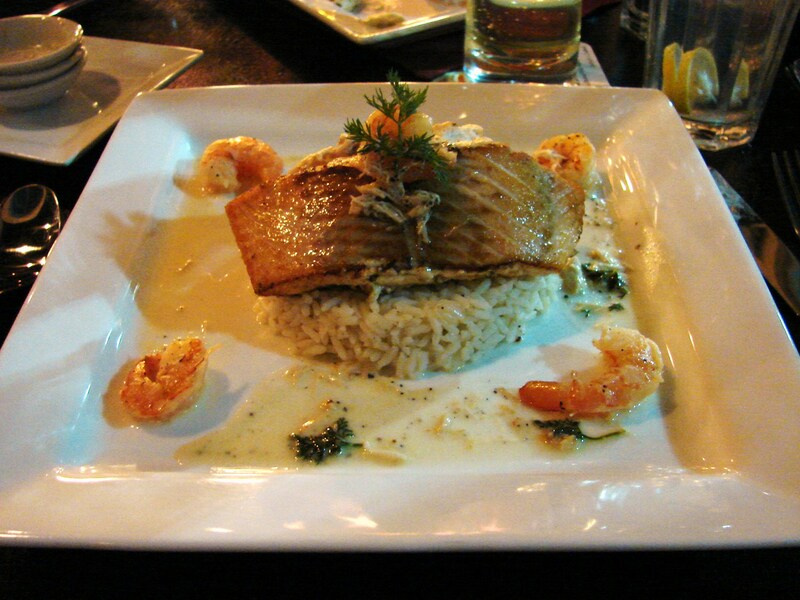 For my entrée, I was wavering between the Pan-Seared Stuffed Salmon and the Southwest Broiled Shrimp. (Check their Facebook page for their up-to-date menus.) After talking with Linda and her husband, the chef, who also came out to speak to me about my selection, I chose the Pan-Seared Stuffed Salmon. The crab meat in the stuffing is real crab meat, not the fake-gluten-containing kind, so no worries there. Before our meals came out, she brought us “Let Them Eat Bread” which consisted of fresh baguette, herbed butters and an eggplant spread. And they didn’t forget me! They brought me out a plate of gluten free crackers – they looked like Crunchmaster brand – to enjoy with the butters and spreads. My companions allowed me to scoop out a bit of each butter and spread first so that I could enjoy them as well, prior to any contamination. Despite generally not liking eggplant all that much, I think that spread was my favorite. Now, on to the entrees! Below is my Pan Seared Stuffed Salmon. It was absolutely delightful! The others at the table enjoyed the Hungarian Goulash, Southwest Broiled Shrimp and Portobello Stroganoff. No pictures, sorry, I was only interested in mine! Ha! Everyone enjoyed their meals thoroughly. After that, Linda twisted our arms and made us order dessert. The rest of the group had some heavenly looking Blondies with caramel syrup, chocolate and butterscotch chips and whipped cream on the side. There was one item on the dessert menu that looked like it could be made gluten free and that was the Stuffed Apple. Except, it usually came with butterscotch chips too and often times butterscotch chips contain barley by way of their flavorings. Instead they asked me if I could have brandy – yep, sure enough! 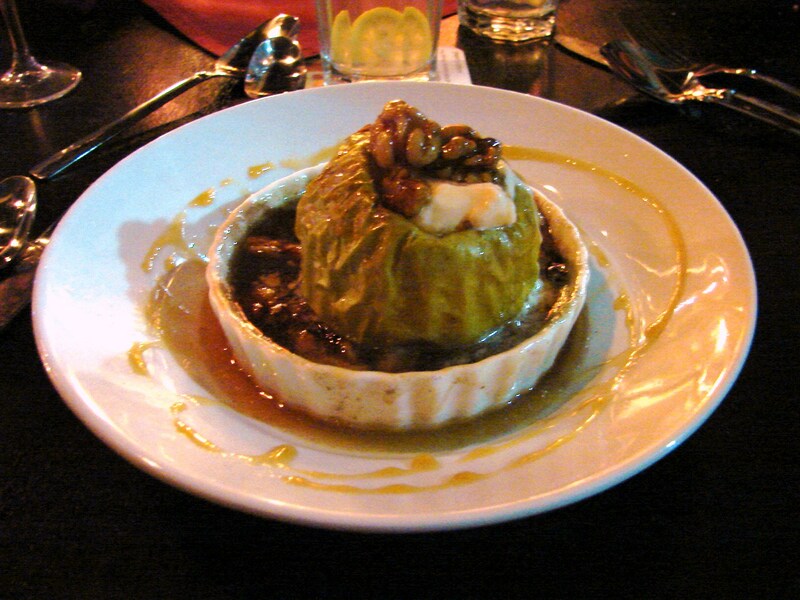 So I ended up with a baked apple stuffed with caramel, nuts and ice cream bathing in a warm brandy sauce. Heavenly! We also enjoyed an after dinner glass of port, of which she has a couple of reasonably priced selections. My husband and I shared a local New Mexico port which was nice. All in all, a wonderful meal with wonderfully attentive service! 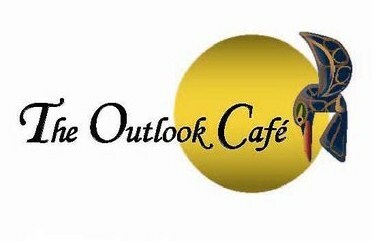 So, if you’re gluten free, be sure to make the drive out to see Linda and her husband for a great meal at The Outlook Cafe. Just be sure to call and let her know you’re coming, I’m sure she’ll treat you well. And here’s a local restaurant critic and his review to check out as well.